A protester in Ferguson on Monday. When kids are trying to understand something that is traumatic for them, or something they do not fully understand, they will factor in fantasy aspects they can control. That’s according to Stephen Zwolak, executive director of the University City Children's Center. One teacher at the center told Zwolak about a 4-year-old boy who was trying to make sense of the situation in Ferguson and the boy added three witches to story of how Michael Brown died. “In early childhood … the most important issue is safety,” Zwolak said. 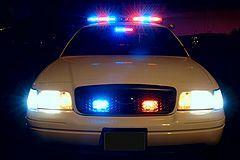 “They need to be physically safe, emotionally safe, and socially safe. Zwolak said he's talking with teachers about emphasizing lap time (for closeness) and facilitating child-to-child interactions differently to mitigate the fact that there is chaos outside. Early childhood educators can also help children learn to accept those who are different from them. “The issues around diversity don’t start in kindergarten. They start in infancy. They start around nine months of age when babies understand others outside of self. So we have the foundations to build a responsible educational community in the world of early childhood,” Zwolak said. "St. Louis on the Air": Gregory Carr Sr., Tom Lawson and Stephen Zwolak share how they are talking about Ferguson with children and students. Tom Lawson is a teacher and chair of the social studies department at McCluer High School, in the Ferguson-Florissant School District. Students return Monday and educators are looking into how they can best address Michael Brown’s death and the aftermath. “Today throughout our district we did a training called RISE which is response, intervention, support, and education,” Lawson sid. “We got a lot of information on how to identify (students who need support). He said the school’s usual staff of 24 counselors will be greatly increased. Teachers talked about making sure they try to connect with students in a comfortable environment and create an atmosphere where students can share information if they think a friend needs help. Lawson says he plans to have conversations with his students about the situation when school begins on Monday. “One of the things [many of his students] are going to want to know is what is the process, what’s happening,” Lawson said. He said teachers in the social studies department can talk about due process and civic responsibility. Citing a potentially volatile situation, Hightower decided to postpone any attempts of trying to mediate, moderate or carry on discussions about what happened in Ferguson. Hightower said the district is developing a framework with teachers of how best to talk about Michael Brown and the subsequent events. He said he expects teachers to have guidance on Monday. Carr, who also is an instructor at Harris-Stowe State University, told his students about his experiences of living close to and working in Ferguson. He also had them write down their feelings about the situation and discuss what they wrote in pairs before continuing with his previously planned class. “As a professional you have got to be objective about the facts, you’ve got to be objective about the situation, you have to be empathetic, and you also have to canister all the diversity that goes into it. … But as an educator we have to have these discussions,” Lawson said. Lawson said that a lot of growth and learning can take place in conversations that happen at school. Even before the recent incidents in Ferguson, race has been an issue that's bound to come up in many homes and classrooms. What kinds of conversations are you having? Please click on the following link to respond through our Public Insight Network: Parents, educators, students: How do you discuss race in your home/classroom? 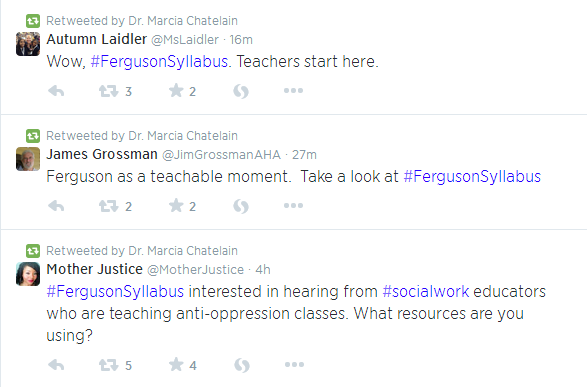 Teachers are using Twitter to gather material and talk about Ferguson. Marcia Chatelain, a history professor at Georgetown University and a University of Missouri–Columbia alumna, created the hashtag #FergusonSyllabus this week to gather that material. What's A Grand Jury? 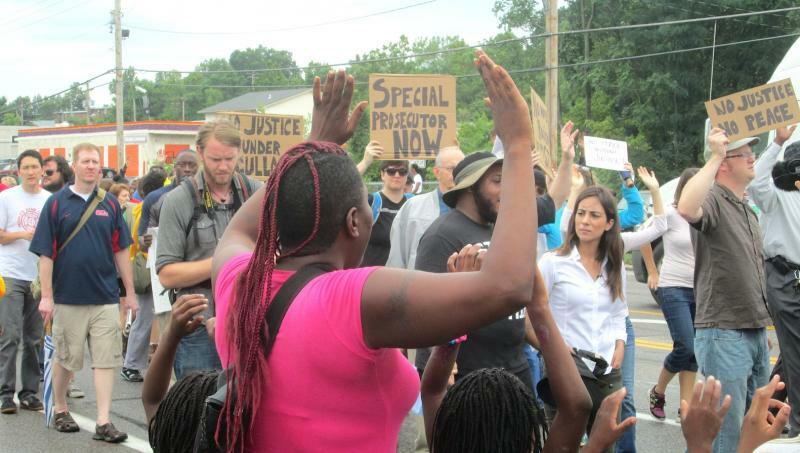 How Will It Work In The Ferguson Case? The purpose of a grand jury, in theory, is to protect citizens against unfair and unwarranted prosecutions by the government. In medieval England, it was viewed as a protection against the Crown. Colonists found the institution protected them against unfair English prosecutions and included the right to a grand jury in the Fifth Amendment. But in practice, the prosecutor who runs the grand jury has a great deal of influence in orchestrating the outcome. A well-worn saying is that a prosecutor could get a grand jury to indict a ham sandwich. Since the unrest in Ferguson began almost two weeks ago, some high-profile officials and candidates – including the nominees for St. Louis County executive – have seemed to be disengaged or no-shows. But, in fact, several have been in Ferguson all along. They just haven't told the press or the public about it. 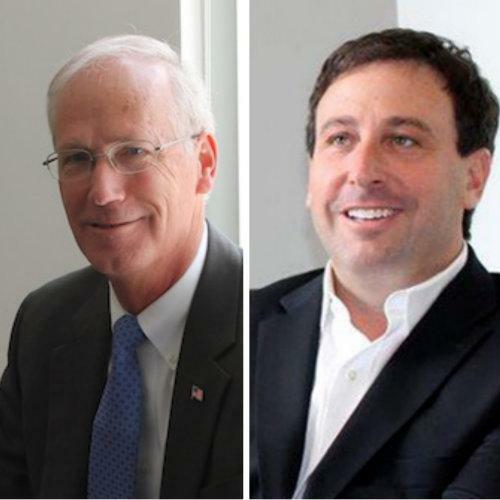 That’s particularly true of the two candidates for county executive, Democrat Steve Stenger and Republican Rick Stream. Each says he’s visited Ferguson at least four times. As tension continues to run high in Ferguson in the wake of the fatal police shooting of Michael Brown, about 75 people gathered on the campus of Webster University for a peaceful protest.